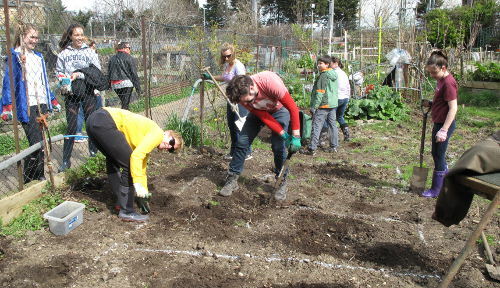 KTCF is partnering with Mind in Camden for an exciting new garden therapy project. Weekly gardening sessions will provide adults with an opportunity to learn new skills and become part of the KTCF local community. The garden was designed and built by super volunteer Mel Chamberlain with support from local organisations. Helping Mel in the preparations, a team of 30 volunteers from The American School in London, cleaned and cleared a polytunnel and dug posts for putting in new raised beds. This is the third time that the ASL community have volunteered for us and as usual we were delighted with their energy and enthusiasm. Other fantastic support came from the astonishing Goodgym Camden runners who shifted 36 railway sleepers and 90 4m decking planks in under 30 mins! We are looking forward to having an official opening ceremony for the MIND Garden in June.